Cyanoacrylates (CAs) have become the adhesive of choice for most hobby and household applications. High quality CAs such as Insta-Cure, when used properly, form bonds that in many cases are stronger than the material that is being adhered. 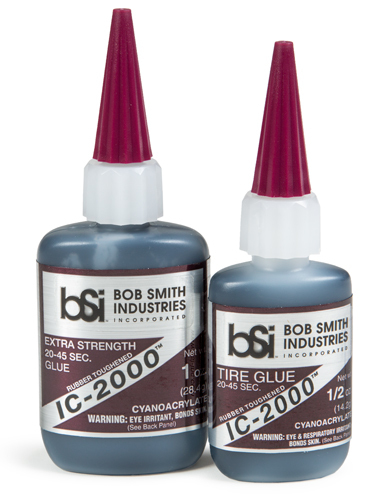 Insta-Cure is a highly refined CA which, combined with its freshness, gives a guaranteed two year shelf life.IC-2000 is a rubber-toughened cyanoacrylate that forms superior shock resistant bonds on non-porous surfaces. The black colored CA has added flexibility for the bonding of metals, fiberglass, rubber, carbon-fiber, and other advanced materials. Set-up time is 20-40 seconds, which can be accelerated with Insta-Set. When cured, IC-2000 is pliable enough to be carved with a hobby knife.